Glide into the night with glistening skin. 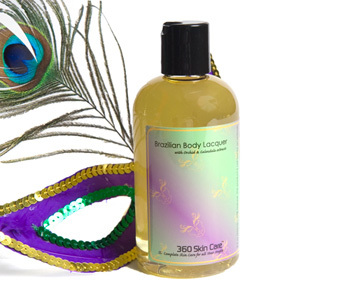 360 Skin Care’s Brazilian Body Lacquer is a vitamin enriched oil with conditioning botanical extracts to nurture and replenish dry skin. Allow your skin to indulge in the powerful reparative and protective properties found in the delicate orchid flower. Orchid extract is a wonderful free radical fighter combined with the healing power found in Calendula, your body will be on its way to smooth healthy looking skin.